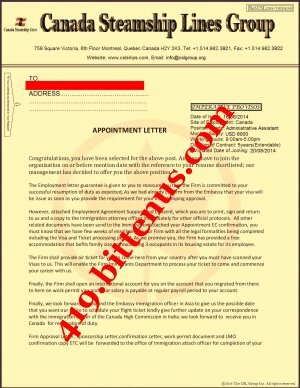 Reference to your earlier forwarded CV, we are pleased to Offer you the attached post in our organization. To assure immediate visa processing we request you to contact Human Resource Manager (Overseas) for processing of your Visa/relevant travel/immigration documents to enable us ascertain your commitment readiness & willingness to join us. The facsimile of this mail also been sent to the Indian representative. Furthermore pursue all the directions concerning your expedition. Due to the sky-scraping number of applicant that we have on our Database, all appointed applicants need to contact immediately with every requirement demanded by the Overseas Hr/Representative to get their VISA. 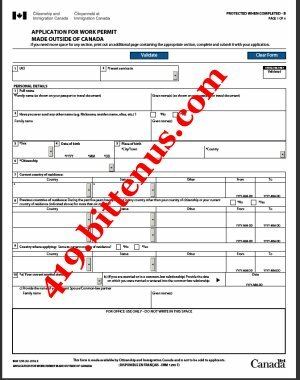 All applicants that are unable to meet the requirements, will automatically be disqualified and his/her personal information Deleted from our database of employment. Formal Interview will be held inside Canadian Embassy before visa endorsement. Contact: HR Manager (Overseas) Mr.Ahmed.S in India via mail immediately: hr@cslgroup.org for further proceeding.